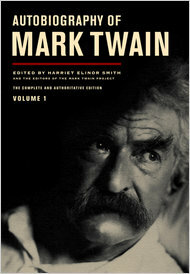 November 2010 marks 100 years since the death of Mark Twain. It also happens to be the month that his complete autobiography is released by the University of California Press. An autobiography is a recollection written by the person who lived it (sometimes with assistance from a professional writer). For example, President George W. Bush will publish an autobiography of his time as president after the election. How, then, can Mark Twain publish an autobiography 100 years after his death? Bonus: Post the answer as a comment to earn five bonus points.